Located in the upper end area of Samui, you will find us below well known luxury Sandalwood resort on the hillside. If you love sea views and are looking for relaxing holidays with all options nearby, we are your place to be. Many of our guests ask how far the popular Vikasa yoga resort is from us as they would like to attend classes their, but would like to have cheaper accommodation nearby. In fact the Vikasa is only a few hundred meters from us, so staying with us is no challenge if you exercise there. Regarding locations here on Samui we got some tips. 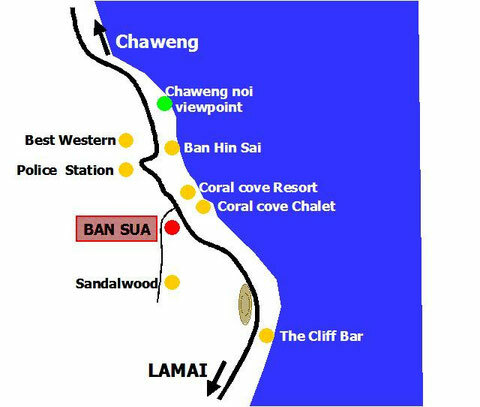 Chaweng and Lamai are the "have to go" touristic places on Samui. As mentioned we are near those crowdy areas, but luckily not in it. So you can avoid the all day / night long very noisy night life area around the Arkbar and the Green Mango, if you like to rest more calmy. As Chaweng center and Bangrak are in the landing / starting zone of the airport, those two areas may frequently harrass you with plans about 100 m over your head. On the other hand, if tourists prefer to stay at a resort all day or within a 500 m diameter (after that it is uncomfortable to walk as Samui is hot) and do enjoy the battle at the sunbeds and buffet with all inclusive alcoholic drinks to facilitate getting sunburned red skin more quickly, staying in Chaweng center and Lamai center can still be a nice ant like spot, but the world is changing. Most tourists nowadays want quality holidays and explore the area where they make holidays themselves in order to create a memorable experience in life, as lovely memories are the only things of your life time you can take with you over time. All other may go, change or pass away, but in your memory you can still go to every moment or place you want & loved. The full moon party in Koh Phangan ist still an event and worth considering If the full moon party is happening during your vacations with us and you thing about going to the full moon party. Please ask us, with a few tips from us it is an still good experience and we can arrange tickets for it as well.